One of the things I was eagerly looking forward to on my recent visit to Santiniketan was the weekly haat or market where local craftsmen and now, traders from surrounding areas and even Kolkata, set up simple stalls to sell their wares. The haat happens in Sonajhuri, in the Khoai area of Bolpur. Santiniketan has become a hub of NGOs and local craftmen's organisations that now work together to promote the innumerable local handicrafts ranging from pottery, batik, kantha embroidery, to woodwork, dokra crafts, and much, much more. The weekly haat is now spread over three grounds, each walkable distance from the others, and is definitely worth a visit if you are in Santiniketan. Plan your visit in such a way that you're there on a Saturday evening so you can visit the haat. Carry cash. And like me, carry a big shopping bag too! While you can bargain a little the vendors are not very flexible about the prices. 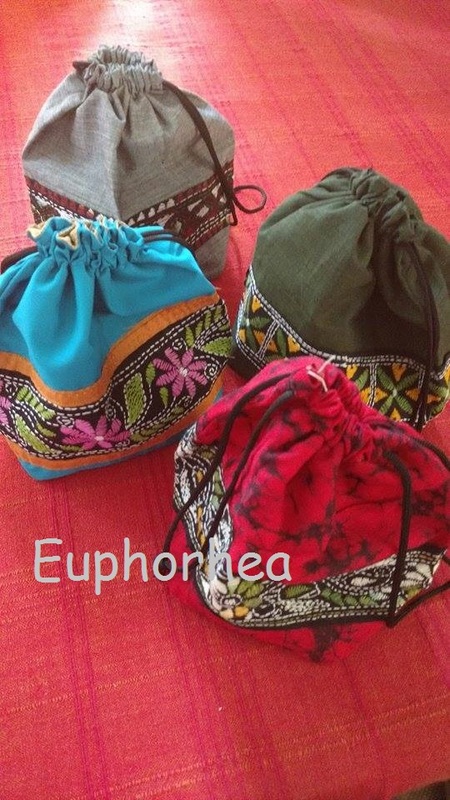 But don't let that stop you from buying a host of beautiful hand crafted things at the haat. The stalls are all simple sheets of cloth or jute spread on the ground with the wares laid out. There are a few food stalls too selling tea and typical Bengali snacks and sweets like pithe, pathi shapta, etc. Loofahs, table mats, coasters, and other knicknacks made of grass. Jewellery! So many colours and designs. And you can see piles of kantha embroidered sarees in the next stall. The work is simply stunning and if you're into sarees then it's a good idea to shop for a few here. Dokra seller. Made using the cire perdu or lost wax technique, dokra metalware is a traditional craft in Bengal and Orissa. While you get dokra-ware in most fancy shops in the big cities buying it from the artisan himself is something else entirely. Don't miss the adorable owls! 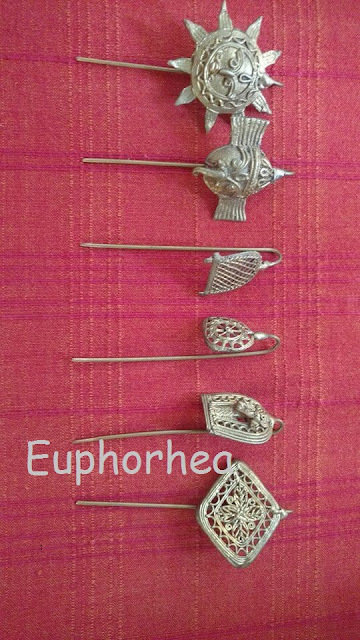 These are some hair-pins I bought. Aren't they pretty? Handmade wooden combs with pretty patterns. This was love at first sight for me. I'm a sucker for embroidery and picked up a pile of these potlis with kantha work on them. These will be perfect as gift bags for the foodie goodies I give my friends. One of the big highlights of the haat - the baul singers. These minstrels wander the countryside singing about life, the universe and all its ironies. We heard them sing a tongue in cheek version of a very popular song and I was highly entertained! The fun thing about this haat is that there are different vendors every week. Some might be back the next week too, but you can be sure you will see a hoard of other sellers and products every Saturday along with a host of new faces.